The Royal Pantheon, called Prasat Phra Thep Bidorn in Thai, is the largest building on the upper platform. It was built on the east end of the platform, next to the Phra Mondop, by King Rama IV. It was originally intended to house the Emerald Buddha. 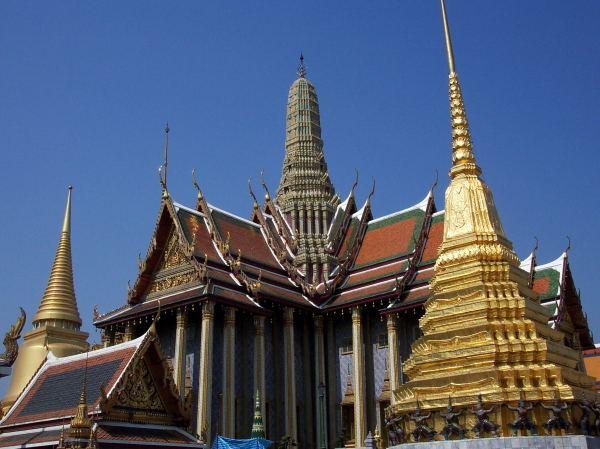 King Rama IV observed that the Phra Mondop on its elevated platform occupied a higher position that the Emerald Buddha. He ordered the new building constructed on the platform, which was extended to accommodate it. Unfortunately, the building proved too small and the plan to have it house the Emerald Buddha was abandoned. It's unclear what the building was initially used for, but during the reign of King Rama V, it was destroyed by fire. King Rama VI restored the building and dedicated it as the Royal Pantheon of the Chakri Dynasty. Inside are exact life sized statues of each of the kings of the Chakri Dynasty. The building is only open to the public on one day a year - Chakri Day, which falls on 6 April every year. The Royal Pantheon is flanked by two gilded chedis (pagodas) originally built by King Rama I. One of the chedis is devoted to his father, the other to his mother. A row of very colorfully dressed demons appear to support the pagodas. These demons make a popular background for photos.